As the nation’s largest federal food assistance program, the Supplemental Nutrition Assistance Program (SNAP) is the first line of defense against child food insecurity. SNAP works efficiently and effectively by providing low-income households with monthly funds specifically designated for food purchases. Research links participation in SNAP for 6 months with an 8.5 percentage point decrease in food insecurity in households with children. Given their higher prevalence of food insecurity and high rates of participation, children are SNAP’s greatest beneficiaries. In 2015, 19.2 million children relied on SNAP for access to consistent food. Beyond its role in fighting food insecurity, SNAP significantly reduces child poverty and helps struggling families to make ends meet: SNAP benefits lifted 1.5 million children out of poverty in 2017 alone. Under current law, individuals who are deemed Able-Bodied Adults Without Dependents (ABAWDs) are limited to accessing SNAP just three months out of every three years unless they can log 20 hours of work per week. However, these requirements are often untenable for individuals who face structural barriers to employment or sufficient work hours. 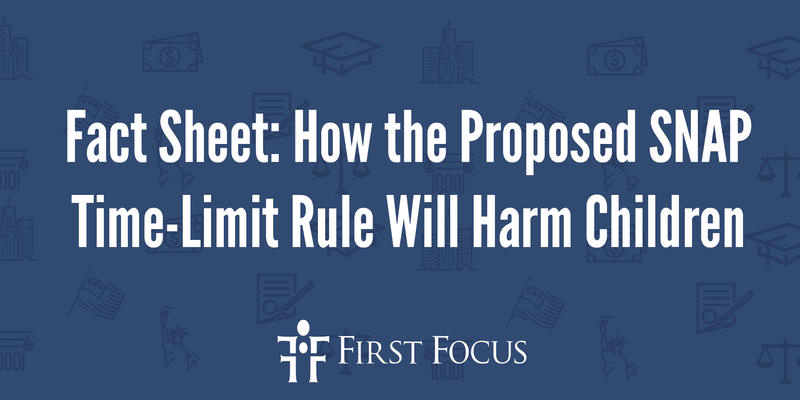 As a result, states have flexibilities: they can exempt 12 percent of the impacted population from the time-limit, as well as apply for waivers for additional exemptions from the US Department of Agriculture (USDA) based on high unemployment rates. A recent proposed rule from the US Department of Agriculture would undermine that flexibility by tightening the requirements by which states can receive time-limit waivers for so-called ABAWDs. As a result, the agency expects over 750,000 individuals to lose access to SNAP. Already, this is a counterproductive and cruel policy: various studies illustrate that kicking people off of critical assistance programs does not help them achieve economic self-sufficiency, but instead harms their health and productivity. Data from 2013 and 2014 shows that the overwhelming majority of SNAP participants who struggle to meet the threshold of 20 hours of work per week are not uninterested in working, but instead are experiencing the consequences of volatility in the low-wage labor market, caregiving duties, or personal health issues.